Real Love is based on respect, compromise, trust, moonlit walks and...... Candle Light Dinners. So whether you are basking in the glow of a new romance or rekindling a seasoned one, candle light dinners always help you connect with your loved one. 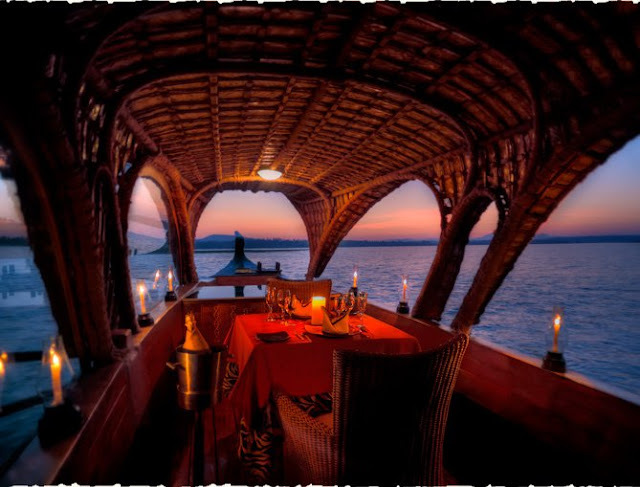 Experience a romantic candlelight dinner on a private cruise sipping on tipple of choice while enjoying the view of a spectacular sunset. The cool breeze and soothing sound of birds and water will intensify your escapade. Mumbai - Book a luxury yacht through any of the popular yacht charter companies in Mumbai. Kerala is famous for its backwater cruises on luxury house boats which are regarded as one of the world’s top ten journeys. Opt for a day cruise or overnight stay on these exotic barges. 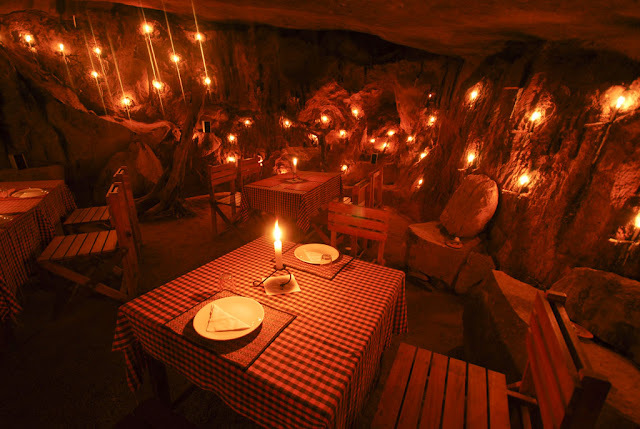 The next time you are in Wayanad (Kerala), head for a romantic cave dinner at the Edakkal Hermitage. The caves at Edakkal considered as one of the earliest settlement of human beings on earth will be the perfect host to a perfect evening. Have a magical candlelight dinner on a Tree House amidst a forest during a Safari stay at the Tree House Hideaway (Bandhavgarh Tiger Reserve). This is a wonderful setting for soft conversations and quality time and perhaps more memorable than spotting the elusive striped star. Enjoy a private 4 course candle light dinner during a romantic getaway at the Windflower Resort and Spa, (Wayanad) nestled in 25 acres of lush coffee estate. 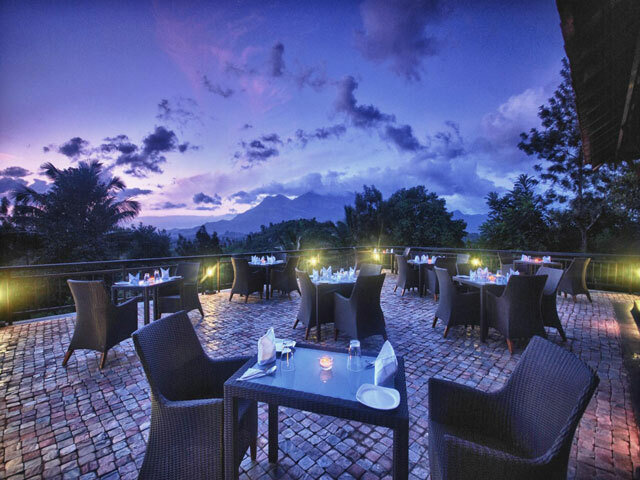 The panoramic vista will surely inspire you for some intimate conversations. Experience a romantic evening the way the royals did by indulging in romantic candle light barbeque at the private beach of Vijay Vilas Palace, Mandvi (Kutch). The sunset at this beach is breathtaking and so will your evening. Image courtesy The Beach At Mandvi Palace. 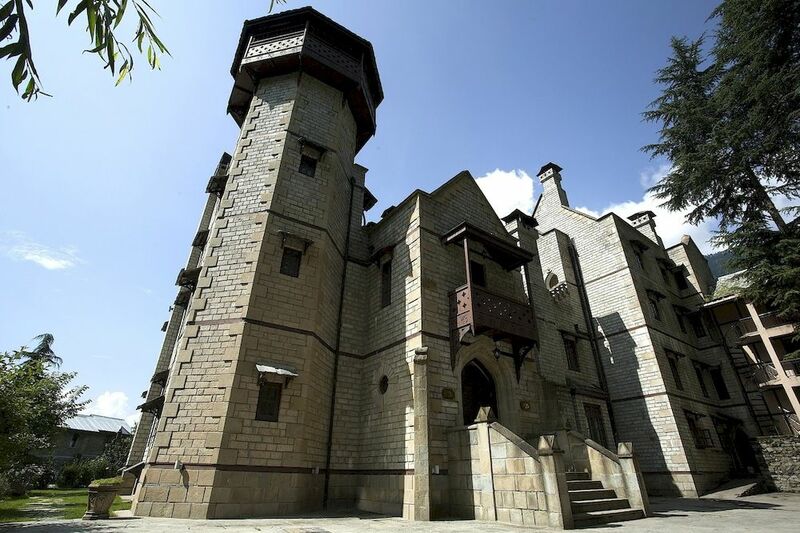 Be a knight in shining armor as you court your princess at this castle built in Victorian Gothic Revival style at a romantic candle Light Dinner overlooking the Himalayas. Forts have always captivated our minds with the many stories we hear about these majestic structures. But the ones we always choose to remember are the ones of Kings and Queens and their romances. 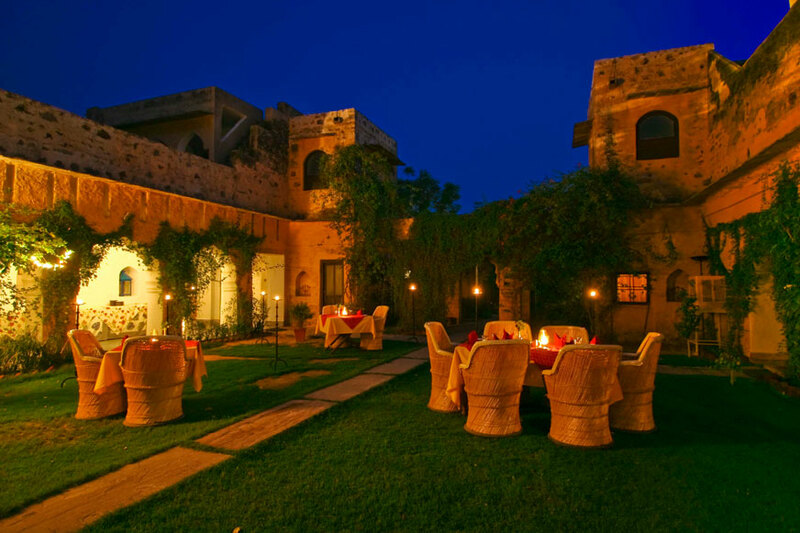 A candle light dinner under the cool starry sky at the Neemrana Hill Fort Kesroli - Alwar (Rajasthan) will set your heart on fire. 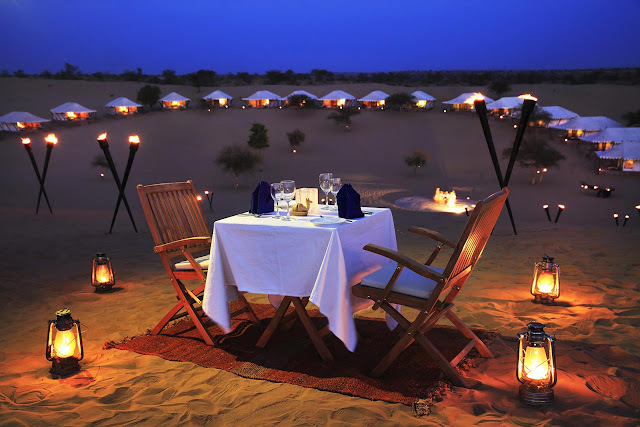 Sitting down on a sand dune in the heart of the Thar Desert, you can probably hear nothing but throbbing hearts breaking the silence as you enjoy a candle light dinner at the Samsara Luxury Desert Camp, Jodhpur (Rajasthan). If you’re bored of the monotony, try these ideas. You will most definitely end up having a lot of fun with each other or you can let us know your idea which creates a memorable essence of romance in the comments section. Aaah - candlelight dinners are so special. Best Place for Wedding & to Spend Vacations Heritage Resort Udaipur - Heritage Resort a nature lover’s delight was founded in 1994, to give you the most comprehensive environmental and cultural experience. With an Ethnic Design, Beautiful Manicured Gardens, Waterfalls, Picturesque Landscape. 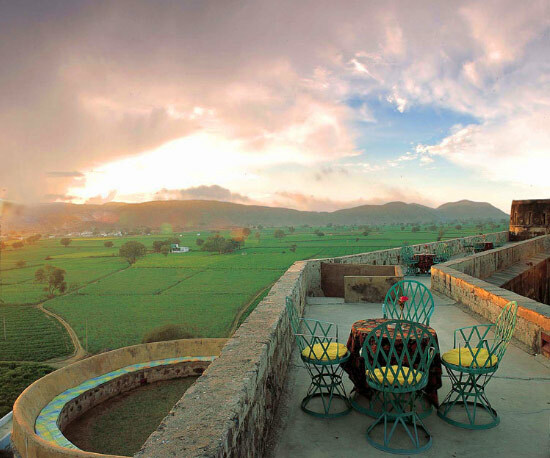 The hotel features cottage style luxurious rooms with an ageless rustic beauty and private “Jarokhas” with an undisturbed view of dotted Aravalli hills & Shimmering Lake Bagela.